Our walking notes told us that this promised to be a long and somewhat arduous day of 18 miles walking on the way to Logrono, so we head out early. At the bus stop, just a few blocks from our hotel, we saw a number of pilgrims who appeared to be taking the bus to Logrono. We wondered why, and later we would find out. 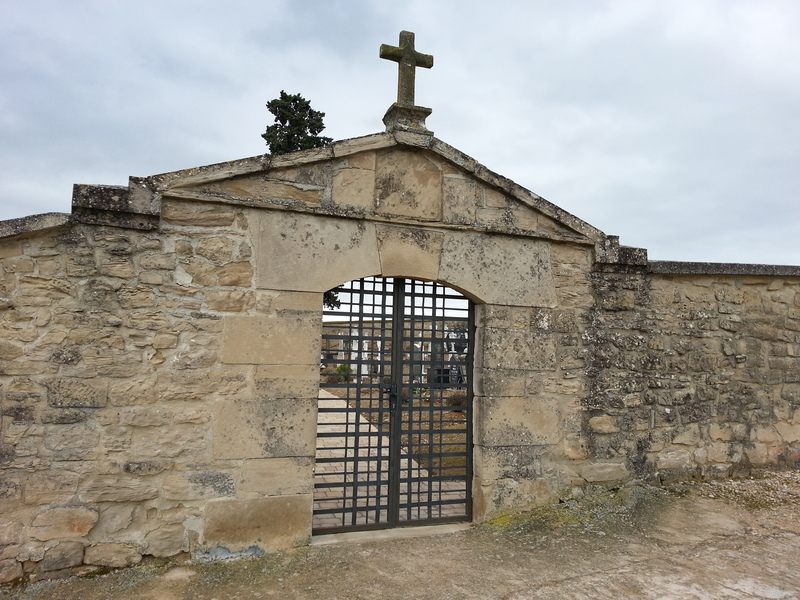 At the outskirts of town we passed an interesting cemetery. The gates were locked, so we just moved on. Once out on the trail, the clouds subsided and the warm sun was at our back. Within an hour or so, we had reached the classic Pilgrim town of Torres del Rio with its narrow and winding cobblestone streets. It was here we happened upon the wonderful Iglesia de Santo Sepulcro, a 12th century structure based on the church of the Holy Sepulchre in Jerusalem. We poked our heads in here and stood for a while at the back to soak in the atmosphere. It was cold and dark, but one could actually feel the crisp acoustics in the octagonal building. From here, we had a significant climb up to Alto del Poyo, and then we dropped down dramatically to the Rio Cornava and made our way slowly up to the town of Viana. 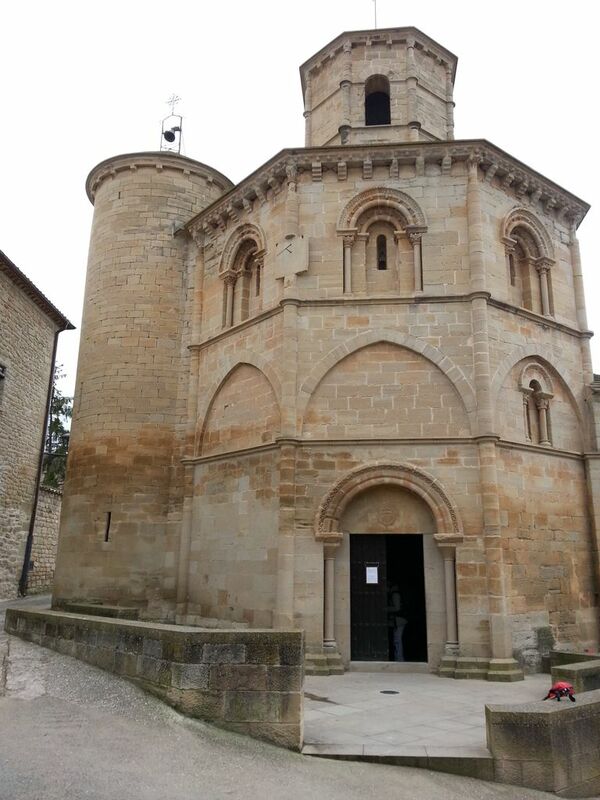 The Camino led us right through the middle of town and we passed the beautiful Iglesia Santa Maria. 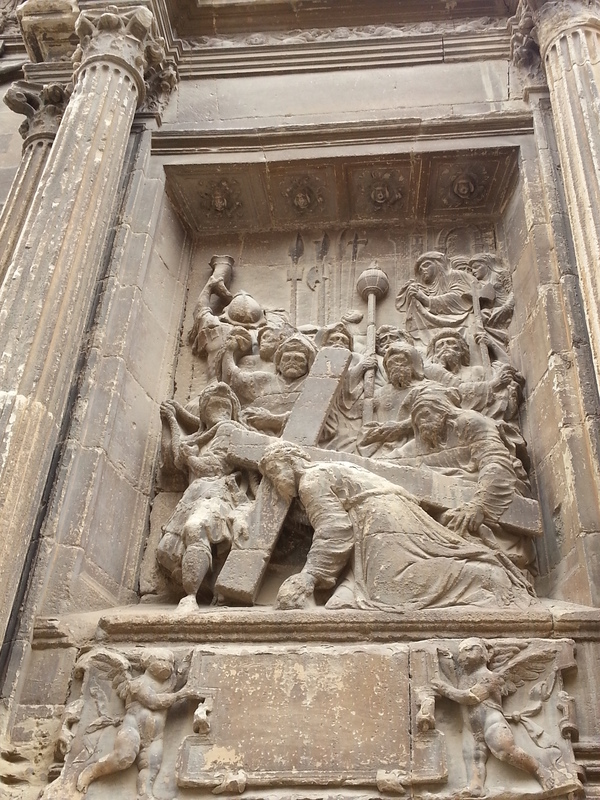 Outside the church was the tomb of Cesare Borgia as well as the amazing in-laid sculptures of the agony of Christ. 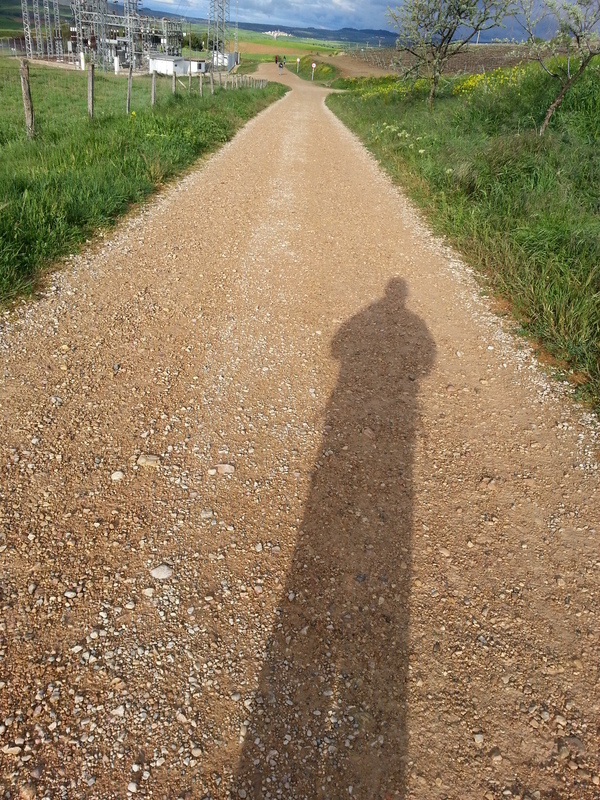 There was another really steep descent out of Viana before the Camino leveled off into the La Rioja wine making region. 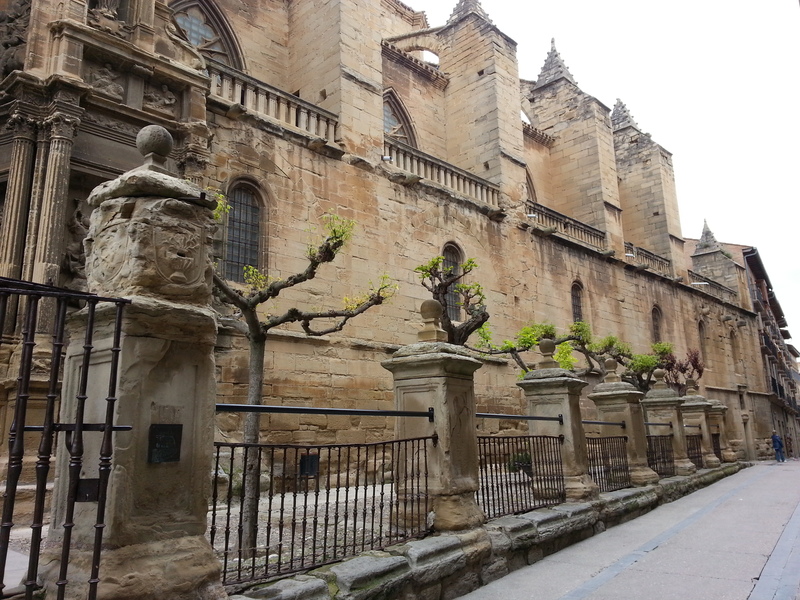 At the outskirts of Logrono, we met up with Sandra and Cynthia and walked all the way into the city. This was a long slog through an industrial section before reaching the Ebro River and the parks that skirt the town. Sandra and Cynthia told us that they were planning to spend two nights in Logrono. We said goodbye and found our hotel (F&G) which was at the north end of town as we headed in. F&G was a beautiful, modern hotel, and Greg and I enjoyed a respite from the more basic stuff we had been experiencing. In the bar downstairs, after a glorious shower, we had a glass of wine and made plans for dinner. 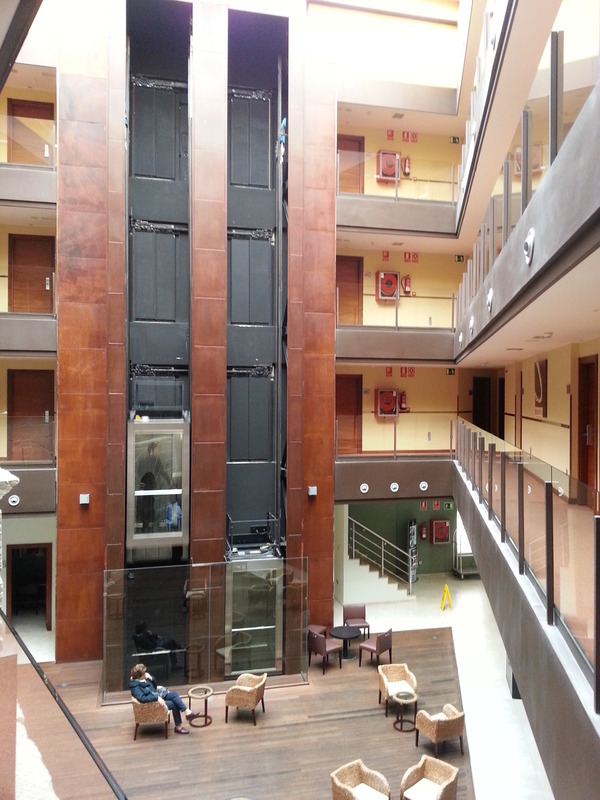 The desk clerk recommended that we head to the Plaza Mercado for a variety of restaurants. I decided to give my feet a rest from the hiking boots and opted for the Teva sandals to walk around town. This turned out to be a big mistake! Trying to see a menu at one of the restaurants, I inadvertently tripped over a small curb and took a header onto the cobblestone pavement. Two Spanish girls at a nearby outside table looked on in horror. While Greg rushed over to help me, I managed to get to my feet and found that I had stubbed my toe so badly that I could hardly walk. We hobbled into a nearby café and decided to eat there, although we really couldn’t understand the menu items very well. At the table, I was flooded with fear that I might be unable to continue because of this injury. Needless to say, dinner was not a very enjoyable experience that evening. Later, I limped back to the hotel and assessed the situation. Swallowing an 800 mg Ibuprofen to deaden the pain, I fell asleep hoping and praying that the morning would bring good news.